Another shining example of RPMSPORTS commitment to excellence! We sell ONLY THE BEST! With a QRS rating of “A+”, this boat package is soooooo close to showroom your neighbors will think you brought home a brand new $30,000.00 package. Then they will probably bother you for a loan. Hope not! This boat was so well equipped and maintained. Most fishing boats of this style are used in salt water. This one was never used in salt, which is the only kind of fishing boat you should buy. Salt exposure will at some point in the future cost you money. 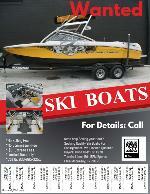 RPMSPORTS’ unbeatable financing makes this boat extremely hard to pass up. RPMSPORTS is one of the very few dealers that provide warranties, insurance and instant in-water demonstrations to qualified buyers. We make sure you have no surprises after you purchase. Call us at 830 865 3251 or email: sales@rpmsports.com. Our motto is “IT JUST DON’T GET NO BETTER THAN RPMSPORTS”.